Background Tissue sampling for biliary stricture is important for differential diagnosis and further treatment. The aim of this study was to assess a novel dilation catheter-guided mini-forceps biopsy (DCMB) method in the diagnosis of malignant biliary strictures. 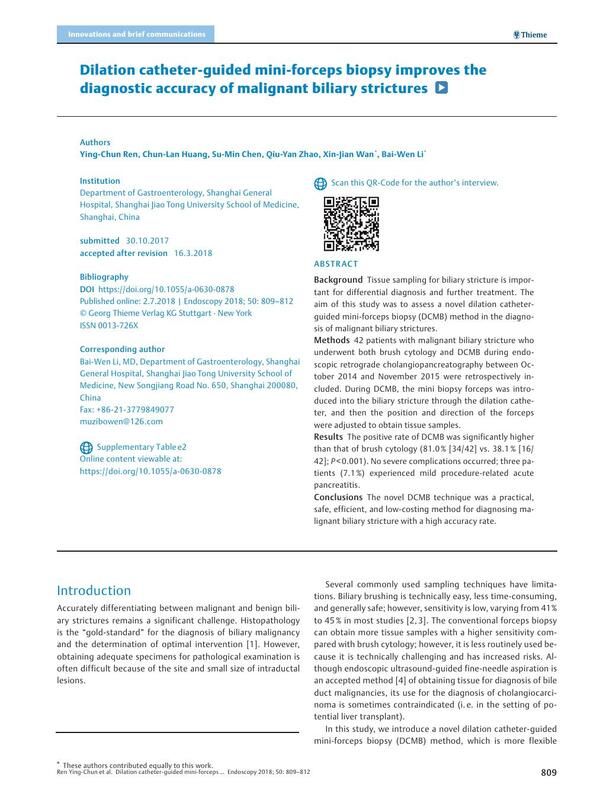 Methods 42 patients with malignant biliary stricture who underwent both brush cytology and DCMB during endoscopic retrograde cholangiopancreatography between October 2014 and November 2015 were retrospectively included. During DCMB, the mini biopsy forceps was introduced into the biliary stricture through the dilation catheter, and then the position and direction of the forceps were adjusted to obtain tissue samples. Results The positive rate of DCMB was significantly higher than that of brush cytology (81.0 % [34/42] vs. 38.1 % [16/42]; P < 0.001). No severe complications occurred; three patients (7.1 %) experienced mild procedure-related acute pancreatitis. Conclusions The novel DCMB technique was a practical, safe, efficient, and low-costing method for diagnosing malignant biliary stricture with a high accuracy rate.